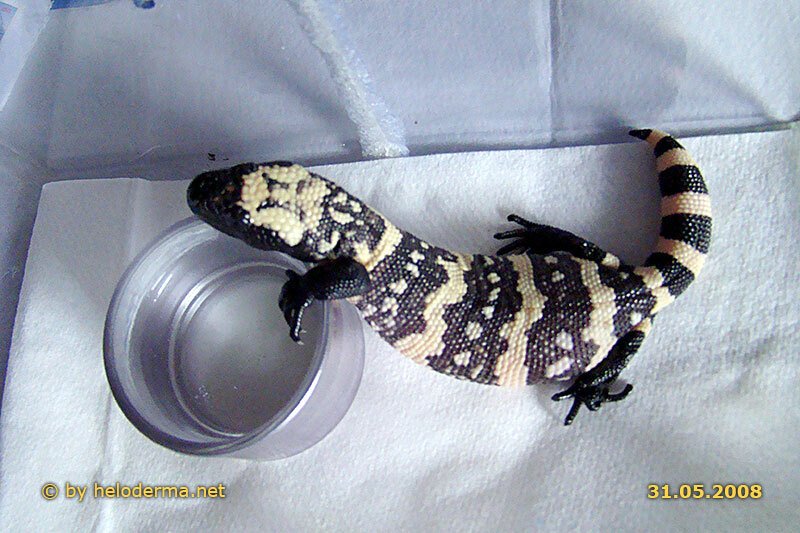 Neonate Heloderma should be kept in individual housing. Styrene boxes of 20x12x12 cm are equipped with paper and a flat water bowl. At this period of time, I determine the sexes and the photo documentation with individual coding and date and place where hatching occurs. 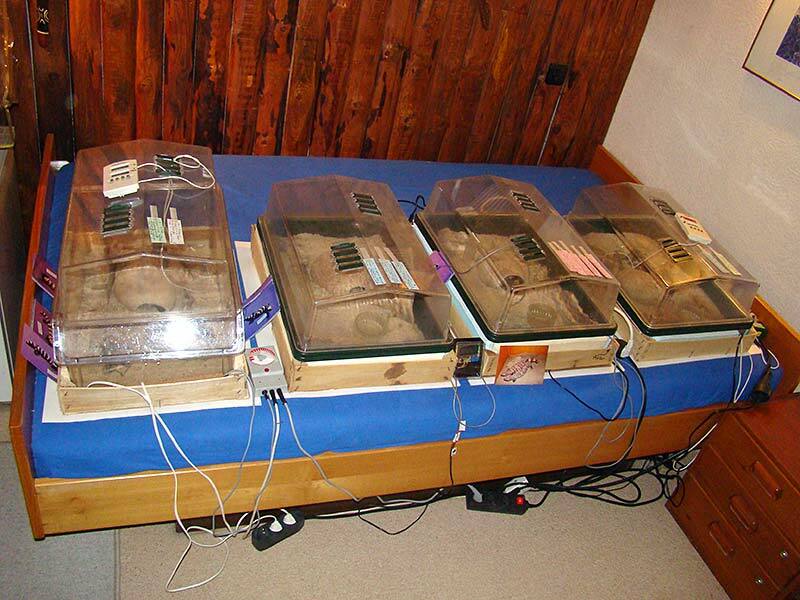 After about one week, groups of hatchlings with a maximum of 5 individuals are put together. Nursing boxes for plants are very useful for the young specimens. Heating is provided and ventillation supplied via slits on top of the box. Boxes are transparent and provide light. The inner temperature is 26°C and controlled by a thermostat. The ground of the housing is covered with soil. 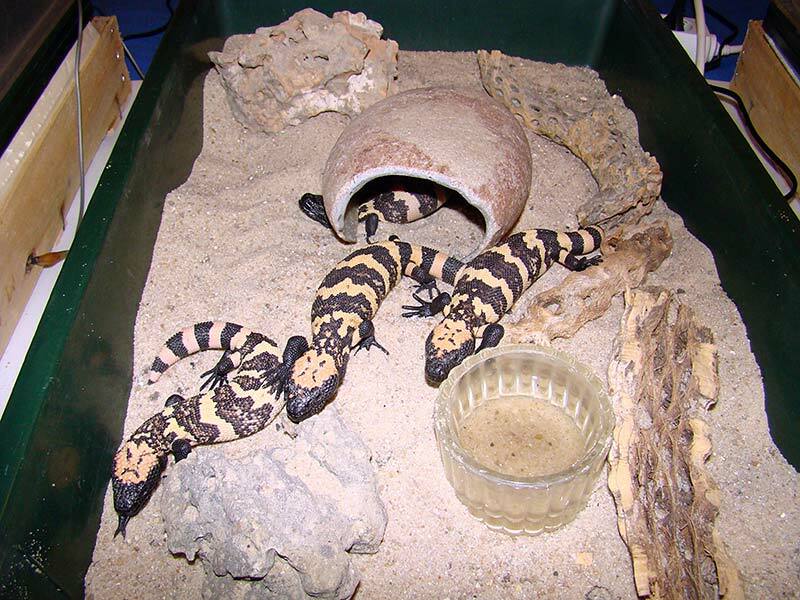 Additional equipment is a hiding box, rocks, cacti wood and a heavy water bowl that can not be turned over. 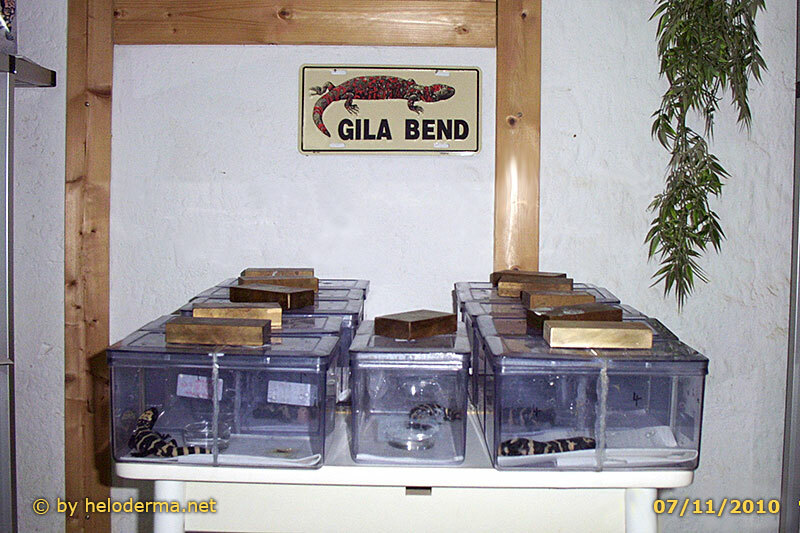 After about 4 months, young Gila Monsters are transferred in groups of two into tanks of 60x40x40 cm. For safety reasons you should always wear heavy gloves and use 30 cm feeding tongs! 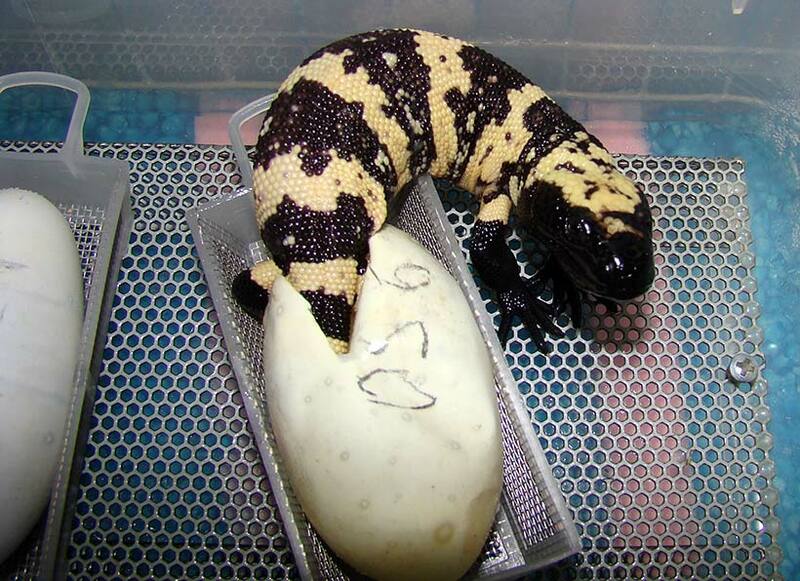 While emerging from their eggs, Gila Monsters have their abdomen distended with absorbed yolk. They have had their first meal already ( see Reproduction ). Some will eat within a few days. Others will wait for a few days more or even two weeks to accept their first baby mouse or rat. In the beginning little Monsters are easily disturbed when offered some food. They react by showing very impressive postures of threat. You have to use little tricks to get them feeding. 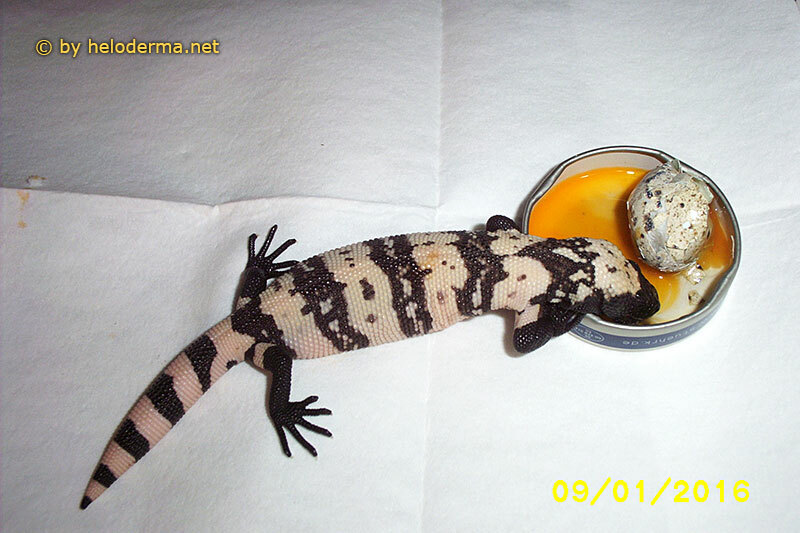 After about eight weeks most Heloderma hatchlings should be ready to accept their food readily from feeding tongs. One feeding per week seems to be sufficient. When reaching adolescence,the food offered should be adapted to the size of the specimen. Every three to four days a sufficient amount of fresh drinking water is necessary. Newborn hatchlings are sprinkled with a spray bottle at least every second day. Youngsters have a thinner skin and are more easily exposed to dehydration. Youngsters do not hibernate the first year of life and take meals on a regular basis. 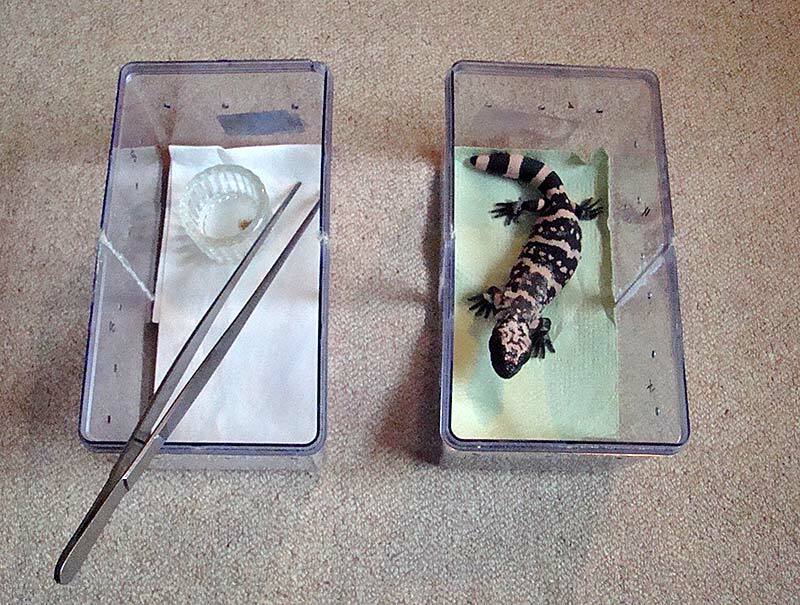 After one year, they weigh an average of 400 grams and will show a total body length of about 35 cm. After one year, male offsprings will show 10% more weight than their female conterparts.